In its first major trade show since owner Gravity Media Group (GMG) acquired one of Europe’s top sports production companies, Input Media, Gearhouse Broadcast introduced its end to end service for broadcasters, content creators and rights owners at IBC. Gearhouse Broadcast also introduced the Skye production vehicle to serve the North American market at IBC, having previously unveiled Columbus, its 4K mobile unit, at NAB 2017 in Las Vegas. 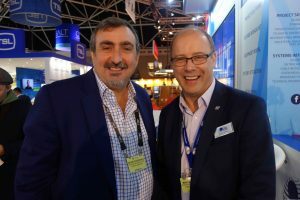 At IBC SVG Europe sat down with Gearhouse Broadcast Head of Systems Integration Kevin Fitzgerald and Systems Integration Manager Martin Paskin to gain insight on what’s new for the show, the company and the broadcast marketplace. Kevin Fitzgerald: “Gearhouse is ‘open for business’ in many many areas – that’s a key message for this show. Certainly the acquisitions of Input Media and Hyperactive Broadcast last year have given us a really broad reach and also the ability to do a different range of events including sporting events. Martin Paskin: “At the moment we’ve got a couple of studio projects that we’re completing in news and sports – one for SABC in South Africa and a general-purpose production studio in Dubai. A lot of these places are still using traditional technologies; there is a fear of moving into IP. So a key thing for me at this show this year is to really find out where we are with IP interoperability. “We have SMPTE 2110 coming in, but there are issues around how you actually control all of that and make it work. Is it workable, and cost-effective, and resilient enough for OB vans or fly-packs? Martin Paskin: “Delivering content from one place to another over IP has been around for quite a long time. There’s actually nothing new there. It’s bringing that technology in to make it work for production, with uncompressed signals and low latency and bringing everything up: then we’re talking about massive amounts of bandwidth, as opposed to distribution. They’re two different things. “We know what it’s like to use IP — we’ve been doing that for a long time. But with live sports you can’t turn around and do it again. If you’ve missed that goal, you’ve missed it. Martin Paskin: “Having just been to the IABM meeting today, it seems the broadcasters would rather go HD with HDR because it doesn’t cost as much. And in reality, if you were to put an HD HDR picture up against a non-HDR 4K picture, chances are the average viewer would think the HDR picture is better – and it doesn’t cost anywhere near as much to get there. “So there is certainly an argument going on in the industry now about 4K. Sports is slightly different. The broadcaster does want to fill those pixels up on screen. We have to remember that. Sports is driving that, more than any other area in broadcasting. In sports, 4K is still important: they may not be doing 4K production at the moment, but they know they will have to in the future. “Then the other issue there, particularly for more distant and remote countries for examples is, do you go down the IP route or do you look at 12 Gig SDI? There’s a lot of 12 Gig SDI around as well.